Tournament favourites Algeria came back from a goal down to eventually earn a comfortable win in their opening game. After dominating the first half, South Africa took a 51st-minute lead when Thuso Phala finished a flowing move. Tokelo Rantie missed the chance to double the lead when his penalty hit the bar and Thulani Hlatshwayo headed past his own keeper to level the score. 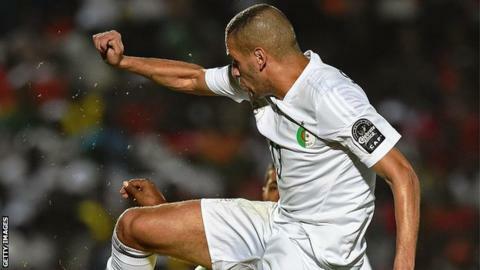 Faouzi Ghoulam put Algeria ahead with a fierce shot and Islam Slimani squeezed the third under goalkeeper Darren Keet. South Africa will feel they missed the chance to cause a shock - especially after having the better of things for two-thirds of the match. It was only Algeria goalkeeper Rais M'Bolhi who kept them at bay in a largely disappointing first half. In the 23rd minute he tipped a 35-yard shot from Doncaster midfielder and South Africa captain Dean Furman on to the bar. Then in the 42nd minute he bravely dived at the feet of Sibusiso Vilakazi as he was going round him and 60 seconds later was called into action again to save Andile Jali's shot with his knees. South Africa went ahead early in the second half when Phala slotted the ball home from eight yards after lovely build-up play from Rantie and Vilakazi. Three minutes later Vilakazi was brought down in the penalty area by Aissa Mandi - but Bournemouth striker Rantie hammered the spot-kick against the top of the bar and that proved to be the turning point. Algeria levelled when Yacine Brahimi slung in a cross from the left and Bafana defender Hlatshwayo managed to loop a header over Keet and into his own net. Four minutes later Algeria were ahead when left-back Ghoulam powered his way into the left-hand side of the area and hammered his first international goal past Keet. Slimani made the match safe in the 82nd minute when his shot from the edge of the area trickled through Keet and rolled over the line. The victory puts Algeria top of Group C on goal difference ahead of Senegal who beat Ghana 2-1. "I think our boys did very well in this game - but it's made things difficult for us because the last two games are must win. We still have two games to rectify our mistakes. "We gave it away ourselves. This is what we're talking about - complacency. When we were 1-0 we created four chances - bury all those chances, we're gone. The missing of the penalty killed us and really disorganised us." Match ends, Algeria 3, South Africa 1. Second Half ends, Algeria 3, South Africa 1. Foul by Ishak Belfodil (Algeria). Siyabonga Nhlapo (South Africa) wins a free kick in the defensive half. Substitution, Algeria. Soudani replaces Yacine Brahimi. Rafik Halliche (Algeria) wins a free kick in the defensive half. Foul by Oupa Manyisa (South Africa). Corner, South Africa. Conceded by Rais M'bolhi. Corner, South Africa. Conceded by Faouzi Ghoulam. Foul by Yacine Brahimi (Algeria). Thuso Phala (South Africa) wins a free kick in the defensive half. Substitution, South Africa. Mandla Masango replaces Sibusiso Vilakazi. Corner, Algeria. Conceded by Anele Ngcongca. Goal! Algeria 3, South Africa 1. Islam Slimani (Algeria) left footed shot from the centre of the box to the bottom right corner. Assisted by Ishak Belfodil with a headed pass. Offside, Algeria. Yacine Brahimi tries a through ball, but Carl Medjani is caught offside. Substitution, South Africa. Bongani Ndulula replaces Tokelo Rantie. Foul by Sibusiso Vilakazi (South Africa). Yacine Brahimi (Algeria) wins a free kick in the attacking half. Delay in match Rafik Halliche (Algeria) because of an injury. Goal! Algeria 2, South Africa 1. Faouzi Ghoulam (Algeria) left footed shot from the left side of the box to the high centre of the goal. Assisted by Sofiane Feghouli with a cross. Attempt blocked. Carl Medjani (Algeria) right footed shot from outside the box is blocked. Corner, Algeria. Conceded by Oupa Manyisa. Attempt missed. Saphir Taïder (Algeria) left footed shot from outside the box misses to the left. Assisted by Sofiane Feghouli. Attempt saved. Tokelo Rantie (South Africa) right footed shot from the centre of the box is saved in the centre of the goal. Assisted by Sibusiso Vilakazi with a through ball. Own Goal by Thulani Hlatshwayo, South Africa. Algeria 1, South Africa 1. Offside, South Africa. Dean Furman tries a through ball, but Oupa Manyisa is caught offside. Anele Ngcongca (South Africa) wins a free kick in the defensive half. Attempt missed. Thuso Phala (South Africa) right footed shot from the left side of the box is close, but misses to the left. Assisted by Andile Jali with a cross. Substitution, Algeria. Saphir Taïder replaces Mehdi Lacen. Corner, South Africa. Conceded by Aissa Mandi. Thulani Hlatshwayo (South Africa) wins a free kick in the defensive half. Attempt missed. Andile Jali (South Africa) right footed shot from outside the box is too high. Assisted by Tokelo Rantie.